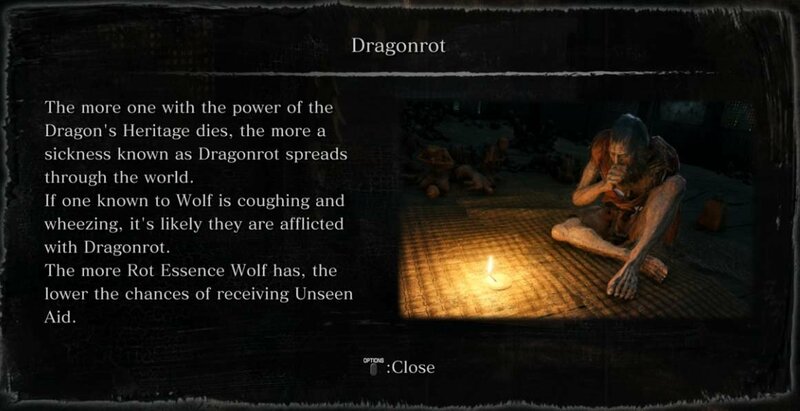 Dragonrot（竜咳，Dragon Cough） in Sekiro: Shadows Die Twice affects the NPCs by making them sick, which prevents progression of their Quests. In addition, the more Dragonrot you accumulate, the less Unseen Aid you will have. Each time you die and respawn at a Sculptor's Idol, the player has a chance to receive a Rot Essence item, which means the NPC associated with that Rot Essence now has Dragonrot. Note: Using Resurrection to revive yourself in battle does NOT cause Dragonrot to spread. Only dying and then respawning at a Sculptor's Idol causes a chance of NPCs contracting the sickness. Dragonrot is a disease that affects NPCs based on how often the player has died. The player receives an item called Rot Essence (which indicate which NPC has been infected) automatically after a certain amount of deaths. Chance to receive a Rot Essence item in the inventory after every death, indicating Dragonrot has now spread to one of the NPCs. Rot Essences are typically received, on average, every 10 deaths. Rot Essences carry the name of the afflicted NPC and the tooltip describes where that NPC can be found (see Notes). Dragonrot can only be inflicted on any NPC regardless of whether or not the player has met them, and the NPC that will fall ill is selected randomly. The initial first Dragonrot of the game is the Sculptor. Multiple NPCs can be affected at any given time. Any quests associated with that NPC cannot be continued at that point. An NPC afflicted with Dragonrot will be coughing and wheezing and will appear sick instead of its usual dialogue. Dragonrot lowers Unseen Aid (30% with no Dragonrot, halved to 15% for the first Dragonrot, but lowered significantly less for ensuing Dragonrots, all the way down to 3%) (confirmation required if 0% is possible). Dragonrot does not seem to permanently kill NPCs. (confirmation required). Truly dying and being sent to an Idol (respawning). Resurrection (being offered a second chance after the player's death, and not being sent to an Idol to respawn) does not affect the player's chances to get Rot Essences in any way: it is therefore safe to Resurrect and then run back to an Idol to avoid any chance on Dragonrot. Dragonrot Restoration: the Recovery Charm key item allows Dragonrot sufferers to be healed from a Sculptor's Idol by consuming an Dragon's Blood Droplet at any Idol to heal Dragonrot from ALL those afflicted. Doing so will not only heal all NPCs but also cause all Rot Essence to disappear from your inventory, and subsequently restore the chance of receiving Unseen Aid to the default value (30%). When the first Dragonrot incident occurs, Sekiro will be teleported to the Dilapidated Temple instead of the last visited Sculptor Idol. There, he will receive the Rot Essence of the Sculptor. By talking with the Sculptor and then Emma, Sekiro will be informed about Dragonrot. Emma will say she will research the disease, and then ask Sekiro to visit her later to see the progress. If the player has met another NPCs by the time the first Dragonrot happens, there is a high chance the player will get another Rot Essence of one of those NPCs. The player can rest at the nearby Idol or come back later to find Emma inside the temple hunched over the Sculptor, where she reveals she is taking a blood sample for analysis. She then requests the player to procure another blood sample from someone else who is also affected. This dialogue will only trigger once the player has acquired at least a second Rot Essence. The Rot Essence's name and tooltip indicates which NPC has Dragonrot (see Notes). Travel to that NPC and start a dialogue with it to get a blood sample. Return to Emma and give her the sample, who will then ask the player to return later once she has made progress with the cure. Rest at an Idol and talk to Emma again. She will give a Dragon's Blood Droplet and the Recovery Charm. Progressing Emma's questline will reveal the reason of Dragonrot. Sekiro's Resurrection power comes from his relationship to the Divine Heir, but his blood is stagnating. The life force to resurrect is thus being stolen from others to make up for it. The process of losing once life force is seen as the effects of Dragonrot. Crow's Bed Memorial Mob can be found at the Outskirts Wall - Gate Path Idol of Ashina Outskirts, on top of a cliff. The Sculptor, found inside the Dilapidated Temple. Once defeating the Divine Dragon and returning from the Divine Realm, he will leave the Temple, and will no longer be subject to the Dragonrot. Inosuke Nogami's Mother can be found in Ashina Outskirts, between the Gate Wall and the Stairway Idols, located in a small, damaged house. She is also the NPC who gives you the Young Lord's Bell Charm, which allows Sekiro to visit the Hirata Estate. Blackhat Badger can be found in Ashina Castle, past the Old Grave idol, by dropping into a house with a broken rooftop after defeating the Blazing Bull and attaining access to Ashina Castle. After purchasing the Iron Fortress and two other expensive items he has to offer, he will move to the Senpou Temple, Mt. Kongo. After raising the kite using the Puppeteer Ninjutsu, he will move to the cave containing the Sunken Valley Cavern Sculptor's Idol across the ravine from the Senpou Temple. Once defeating the Divine Dragon and returning from the Divine Realm, he can be found back in Ashina Castle, lying against a tree just left of the building with a hole in a roof where he was met him. Fujioka the Info Broker can be found at Ashina Castle, on the right side after the first bridge. After completing his quest, he will move to the Dilapidated Temple, near the area outside where Emma stays. Jinzaemon Kumano can be found at Ashina Reservoir when revisiting it, near the exit of the cave where Sekiro was held prisioner at the start of the game. After talking to him at the Reservoir, he moves to the Abandoned Dungeon, near the Bottomless Hole Sculptor's Idol and the Shichimen Warrior mini-boss. After talking to him in the Abandoned Dungeon, he will move near the Guardian Ape's Burrow of the Ashina Depths. After talking to him in near the Guardian Ape's Burrow, he will move to the bridge next to the Water Mill Idol in Mibu Village, near where O'rin of the Water is found. Kotaro can be found in Senpou Temple. Rot Essence are special Key Items in Sekiro: Shadows Die Twice that are acquired after Sekiro's death and respawn at a Sculptor's Idol. The chances for acquiring Rot Essence are not specified in-game. Each Rot Essence is an item that tells you who is afflicted with Dragonrot - NPCs inflicted with Dragonrot may be unavailable to interact with normally, stalling their story progression until the Dragonrot is cured by using a Dragon's Blood Droplet at a Sculptor's Idol (one droplet cures all NPCs). Additionally, the more Rot Essence Sekiro has, the lower the chances of receiving Unseen Aid which prevents losses upon death. The coughing and wheezing sounds of a drunk who has forgotten the sincerity of offerings, yet offers them regardless. Confirmed: you need to interact with NPC&apos;s in order for them to get dragonrot. I just ran through the game and died after getting the prosthetic arm so sculptor got dragonrot. I didnt talk to any broker/merchant/npc as i wanted to run through quick to get to a higher NG. Endgame i wanted to cure sculptors rot but couldnt take a bloodsample so i died and died without getting any dragonrot. Then i talked to the info broker, died and boom. Info broker dragonrot essence. Useless game mechanic that does nothing. Dragon aids doesnt happen that often, it barely affects anything important, and you can always heal it as soon as it pops, you will get more healing droplets than you&apos;ll ever need. Option to give Sculptor sake (for additional dialogue) is gone when he&apos;s under the effect of Dragonrot. Not noticed if it does anything else to him beside give him a cough, as he still fits and upgrades prosthetic tools and offers to give you Kuro&apos;s Charm back (NG+) if he has it. Does Dragonrot prevent merchants from selling to you or anything like that? Goddamn, that&apos;s a lot of text for a mechanic that honestly barely effects anything (unseen aid capping at 30% regardless of how many people you&apos;ve met means it&apos;s never a mechanic you can rely on), especially as (spoiler alert) a large number of the game&apos;s NPCs die by the end of the game for story-related reasons. Possibly worth giving the page some kind of cleanup so the actual "you honestly don&apos;t need to worry about this" and "resurrection does not cause dragon rot, only true death" core messages aren&apos;t drowned in minutiae? Most of the "notes and tips" section is just NPC locations which could honestly just be moved into the rot essence table. Fun fact: if you never got dragonrot when the second Ashina invasion happened (yes I’m a save sum), talk to Emma where next to the dead body of Isshin, there will be a new dialogue “About Dragonrot”, and she will give you both Dragon droplet and Recovery Charm. And Treat Dragonrot option will be unlocked in Idol’s menu. Wish I would have read this first. I kept letting myself die instead of reviving and running because I thought it was spread by reviving and dying again before reaching an idol so I figured it was safer to just die. I definitely got the Rot Essence for Inosuke (I think; the guy dying outside his old mom&apos;s house in early Ashina Outskirts) before I&apos;d met him. I remember trying to puzzle out who it was. Maybe it&apos;s a location progress trigger instead? I am pretty sure npc can get it before sekiro meets them but I cant say for 100% Certainty . ***** this game. Lmfao jk I just die...a LOT. *****in WOLF killed me. A single, solitary, wolf I had the drop on. I am The Yamcha. If you complete game without rot essence and cant take blood samples, dont worry. Emma will give you charm after game ending in kuro room. If you complete game without rot essence and can’t take blood samples, don’t worry.Emma will give you charm after game ending in kuro room. Something I realized after hearing from someone else, phantoms start to show up if you have a lot of dragonrot on npcs. I ran into two at one point and thought it was because I killed a specific boss. However, I now realized I had a ton of dragon rot because I was saving my cures for it. Two phantoms I saw were samurai types that you&apos;d see inside Ashina castle. Resurrection does increase the chances to get Dragonrot. I died a lot against a boss and resurrected like crazy. Once I respawned I got 3 essences at once. There is a lot of false information that if you dont resurrect before true death dragonrot does not occur. I had to test this out as many sources are saying this. I just started a new game from scratch to test this, let myself get killed by mobs 4 times WITHOUT resurrecting and dragonrot still occurred. So I can 100% confirm that the above statement in the Wiki is correct : "Things That Increase Dragonrot-Truly dying and being sent to an idol, whether you resurrected or not. " Do NPCs ever die from Dragonrot? If not, then I don&apos;t need to worry about dying to the same boss again and again.